Leaves rustle behind me. I listen. The minute intermittent scratch—barely audible, but amplified by the silence around me—is the only sound for miles. Besides my own breathing. It’s a field mouse burrowing under the long, golden grass that is my seat. Now a crow croaks above. His wings send a windy squeak into the stillness. If clouds made noise as they scraped over the snow-dusted mountain peaks, today I would hear it. This day my world consists of the shifting sounds and changing colors of wilderness. 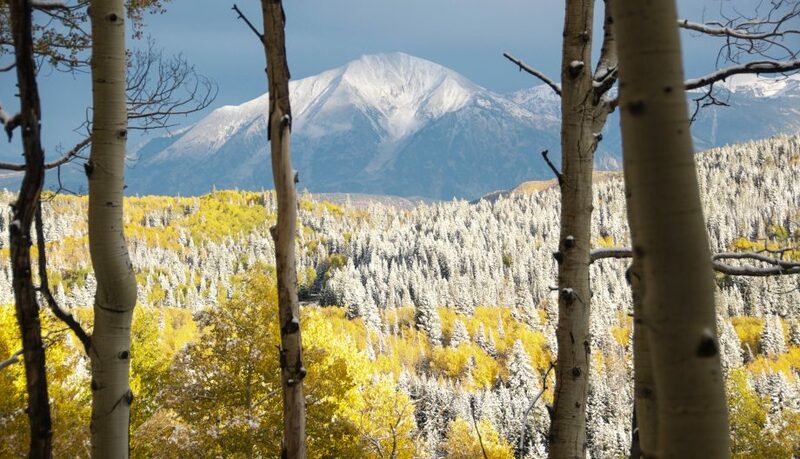 The aspens stand on their milky trunks with their gray branches reaching for eternity. A doe and fawn skitter through the meadow, never realizing my hunting partner and I are there. I can travel only where I can walk, see only to the next ridge, talk only to my friend under the next tree. For this moment life has narrowed, simple. All this as somewhere war ravages, terrorists plan more cowardice, politicians puff up like self-important peacocks, philosophical debates rage, earthquakes rumble, economies tumble, hunger ravages, homelessness decimates, and world events vast as the sky mount. I know these things because the information age is upon me. Information technology speaks loudly and carries a big stick. But not here. Here I’m journaling about field mice, aspen trees, and crows. Would that our worlds could become this small and contained again. Sitting in this meadow I slowly realize, once again, I lack what it takes to fight AIDS in Africa, prevent earthquakes in Pakistan, support the correct U.S. Supreme Court nominee in DC, house the homeless in Denver, adopt baby girls from China, save the environment, stop war, care for my family, stay fit, love my wife, read a good book, be a friend, love God, and figure out global warming all at the same time. I need life narrowed down. I can’t be global. I don’t have enough mind, heart, and soul to wrap around it all. Technology may have shrunk the globe to a village. But it’s still too big for me. Despite their enormity, at one time most human beings would never have heard about tsunamis, hurricanes, and tragedies untold much less be given an opportunity to help. The sun would have risen and set on a day containing, as Jesus said, worries enough of its own. Each day we are bombarded by more information than we can assimilate or even care about. One of my professors put the dilemma this way: we are camel-age creatures living jet-age lives. Call God shortsighted if you like. We seem to have been designed to function best with narrower boundaries. In his outstanding book, “Margin: Restoring Emotional, Physical, Financial, and Time Reserves to Overloaded Lives” Richard Swenson asserts we need a theology of human limitation. We cannot do and care about as much as we believe we can. We need time and ways to shut out the voices telling us to change the world! By gaining distance from the global noise, I can actually hear the people and concerns near me. Otherwise, it feels as if a terrible wind has torn down the walls and ripped off the roof of life and we stand naked and exposed to every storm the world dreams up. Obviously technology is not all bad. My son was born two weeks premature in 1984. A new technology saved his life. And, selfishly, hot showers are remarkable. But there is the law of unintended consequences to deal with. For me these retreats into the wilderness—back in time—help. Through isolation and stillness, through shrinking my world God enlarges my mind, heart, and soul. When I am out in the wild, I sleep in a tent, have no cell phone access, no cable TV, no high speed Internet, and no idea what is going on in the world. But I am not out of touch. When the enormous worries of the world invade, I lift my eyes to the hills and ask, where does my help come from? In response I hear God whisper and even roar in the treetops: I Am here. In the wild—in isolation—for one day—or even a few—time slowed down as golden sunlight chased shadows across the green sage valley for the umpteenth time: I Am timeless, God said. In the glistening eyes of my hunting partner: I see and love, God winked. Snow covered Mount Sopris towered, gleaming in the morning sun: I Am almighty, God assured. The weight of the world is on God’s shoulders. Not mine! Maybe if I let God carry the weight, I can focus on and care about those things I can affect. Thanks God, for whispering louder than a myriad of modern, screaming voices. Thanks for holding the world in your hands. Thanks for narrowing the world down, if for just a moment. I have a new website at https://eugenecscott.com. Eventually I will be publishing only on that site. Please click over and subscribe. A version of this was first published on September 20, 2010 at www.bibleconversation.com.